I was taken totally out of my comfort zone when I was in London at the Cybermummy Conference on the 26th June. Mixing with a HUGE group of women, none of whom I had ever met before had my stomach growling with the nerves that were threatening to overtake my bold statement at booking myself in for the conference in the first place. I swallowed my nerves, gave myself a stern talking to, and made it to the Brewery in time. Walking through the door, I was a little taken aback by the number of stalls that were handing away little things, and asking us to enter competitions. Slightly overwhelmed by the sheer numbers of people who seemed to be milling around talking to each other, I actually felt like I was the only person there that didn’t already know somebody else. I had some cups of coffee, browsed, had some more coffee, and sat and listened to Sarah Brown at her keynote speech. Behind the computer screen, I am a confident, assertive woman, who very much resembles the woman that used to have a career path – but that was pre-kids. Eight years of caring for a child with learning difficulties, including behavioural and emotional problems, and the other stresses it can add, and my confidence had dropped to ridiculous levels. I came across the lovely PR’s on the Leap Frog stand, and for some reason, I began chatting and found I qualified for a brand new and shiny Leapster Explorer and Camera. The chat gave me a bit of a confidence boost, and for that I have to say thank you to Claire. I have a special needs youngster who needs strong toys that are also “cool”. The Leapster Explorer and the Camera, certainly fitted into that category for him. He squealed when I took it out of my bag, and it has remained his favourite toy so far. The buttons are easy, and large enough for him to understand, and the case seems to be tough and practical. The screen quality is also very good which is often unusual in childrens toys and is bright enough for him to play with during the day without drawing the curtains. The back of the leapster holds the 4 AA batteries, and the screw is so large that a regular sized knife will open it easily. I suspect a 5p coin would also do the trick, so no need to carry around a screwdriver just in case of that all important battery run out, just when you need it to keep a youngster occupied. 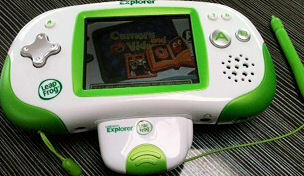 To get the best use out of it, the Leapster Explorer needs to be connected to the LeapFrog Connect application which you get on disk, or can download it for the leaplets (little apps and games ) directly from their website (here). To download a leaplet, there is a starter code with the leapster when you unbox it, and linking up via the computer is actually very simple to do. To buy more download codes, you have to go to specific outlets and have them sent to you, or buy from some toy shops. It would be lovely to be able to order and pay for the games online and have them downloaded instantly. Maybe that is something they are looking at in the future. it’s not a deal breaker and we have another code on the way, along with a game on the way from Amazon, and I do love Amazon. I looked this morning, and they have the Leapster Explorer which should be £59.99 reduced to £44.89. I didn’t find the camera, but it seems to be coming in around the £14.99 mark. One of the things that he is usually very jealous of is that his older brother can take photographs on his phone. He is never trusted with a camera alone, as sadly things just seem to fall apart in his hands, and we all end up devastated. 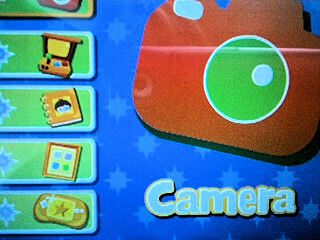 The camera fits into the bottom slot of the leapster. It was surprisingly easy to sort out. It just takes a second to click it into place, then connect to the store through LeapFrog Connect, and download the software for it to work. My boy has taken hundreds of photographs with his, and I was pleasantly surprised to find that the pictures were coming out with reasonable quality, and that the memory in the leapster must be quite good for what you can pack onto it. He can add effects and use distortion effects to huge amusement and much giggling. The camera even lets him take videos, which is an added boost, although I don’t think my son has fully understood everything that it can do. When you set up your parent account, you can also see how your children are progressing through the learning games. All in all, it’s a pretty impressive little gadget for youngsters, and for older special needs children. We are waiting for a game to arrive so I can’t yet comment on those too much yet, but the built in software is keeping him happy so far. The software is all around learning and there are several demos on the leapster that show you what it can do. The demos are very popular and he seems to watch them a lot. I can see there will be many requests for the games on the website for his birthday and christmas list. All in all, it is a huge success in our house for my 9 year old with special needs, and I have seen his brothers sneaking onto it on the rare occasions that it has been laid down. It seems attached to his hip at the moment, and I haven’t had much time to have a good look at everything on it. Sneaking into his bedroom when he is sleeping, I have several times tried to quietly slip my hand under the pillow it is hidden under, only to be met by a sleeping hand shooting out to protect his pride and joy by grabbing it firmly. It’s fantastic. Thank you Leap Frog. We love it. Looks like it would be a great toy for my two monsters, I will check it out. Not easy walking into a big room of strangers – a brave thing to do. Maybe see you there next year.